If we could turn the clock back psychologically, could we also turn the clock back physically? In 1979, social psychologist Ellen Langer conducted a ground-breaking study that aimed to answer this provocative question. For just one week, Langer arranged for a group of elderly men to live in a house staged as though it were 1959, a time that most of them considered their prime. The men experienced amazing changes across the board: their physical strength, cognition, vision, hearing and taste improved dramatically, and by the end of only the second day, all were less dependent on others to get what they needed. Drawing on this elegant study and colorful examples from her full body of work, Counterclockwise explores the ways in which our thoughts control our moods and our physical state; how our attitudes define our limits; how our mindless desire for stability actually cuts us off from the healing power of mindfully attending to variability; and what we can do to be free of these restrictions. At once scientifically riveting and immensely inspiring, the theory and advice in Counterclockwise has enormously exciting implications for our general health, for our outlook, for our fundamental happiness. If the elderly men in Langer’s original experiment could produce such dramatic changes in their lives, so too can the rest of us, but we don’t have to live in a time capsule to do so. This is a gem—a book that is equally practical and philosophical without seeming to be either, and one that makes you feel better—more conscious and more prepared—about growing old, even if you weren’t feeling bad about it in the first place. Take a brilliant, creative social scientist, without any respect for conventional wisdom and you get Ellen Langer. 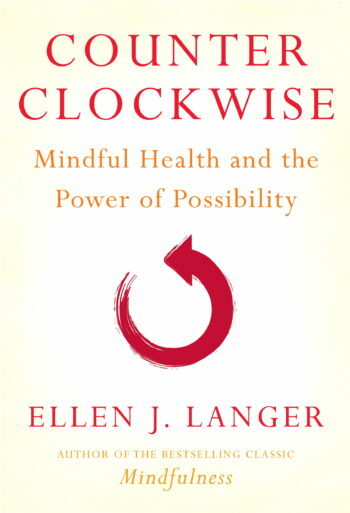 She is a fantastic storyteller, and Counterclockwise is a fascinating story about the unexpected ways in which our minds and bodies are connected.